The Setup: How I Ended up at an Airstream "Hotel"
My plans for a Florida Keys vacation began when a curious set of circumstances coalesced. I travel a lot to test bikes, and at one point I found myself a couple thousand miles short of next year's frequent flier status. What to do? Planning a vacation seemed like the natural solution. Deciding against solo travel, my buddy Allen and I laid down a few rules for our "mancation." #1: The destination should be somewhere we've never been before; #2: Only direct flights, no stopovers; #3: Carry-on luggage only, no pesky checked baggage; and #4, most crucially: Would Ernest Hemingway approve? Oh, and of course the round trip had to be around 2,500 miles for my frequent flier qualification. After studying a world map and tossing out unreasonably distant options (Japan, Brazil) as well as a few tempting but too-familiar destinations (New Orleans, Hawaii), one distinct possibility emerged: the Florida Keys. Though no nonstop flights are available from Los Angeles, the Keys called with their sunny, laid back atmosphere, great seafood, live music, and of course intrinsic connection to Mr. Hemingway, who called Key West his home during one of the most prolific creative periods of his life. After booking our flights into Ft. Lauderdale and opting for four-wheeled ground transportation (since Allen can't seem to come up with a good enough reason to ride), the only missing puzzle piece was a place to stay. I had a vague recollection of a media contact telling me about accommodations that involved one of those classic, aluminum-skinned Airstream trailers docked at a campground. A phone call confirmed my suspicion: Kampgrounds of America (KOA) teamed up with Airstream to offer an, ahem, more civilized way to enjoy their camping experience; connected with electricity, Wi-Fi, a flat screen TV, and running hot water, the Airstream offers all the creature comforts of home. But situated on KOA's Sugarloaf/Key West campground, you also get a waterfront location with the facility's benefits, including campfires and basic watersport equipment rentals. Done deal! When we finally touched down in Ft. Lauderdale, the nearly 200 mile drive down the Overseas Highway—aka, US-1—slowly immersed us into the Keys lifestyle: as the miles pile on, the landscape changes from concrete interstates to lush and swampy waterfront, and by the time you get to Sugarloaf/Key West — the Southernmost KOA campground in the U.S. — you can't help but slide into the laid-back "Conch" lifestyle. Our first food stop found us at the legendary Alabama Jack's, where we stumbled upon a staggering array of classic cars parked by the roadside; as luck would have it, our visit happened to coincide with the Ocean Reef Club Vintage Weekend. We ogled gorgeous pieces of automotive history, then feasted on the first of a series of indulgent meals involving conch fritters, seafood, and of course, key lime pie. Most people are familiar with the bullet-shaped Airstream trailer, an iconic American design introduced in 1936 as an elegantly Art Deco way to travel. Our particular Airstreams were Flying Cloud 25FB models that sleep up to four people across one queen bed and two twin beds. 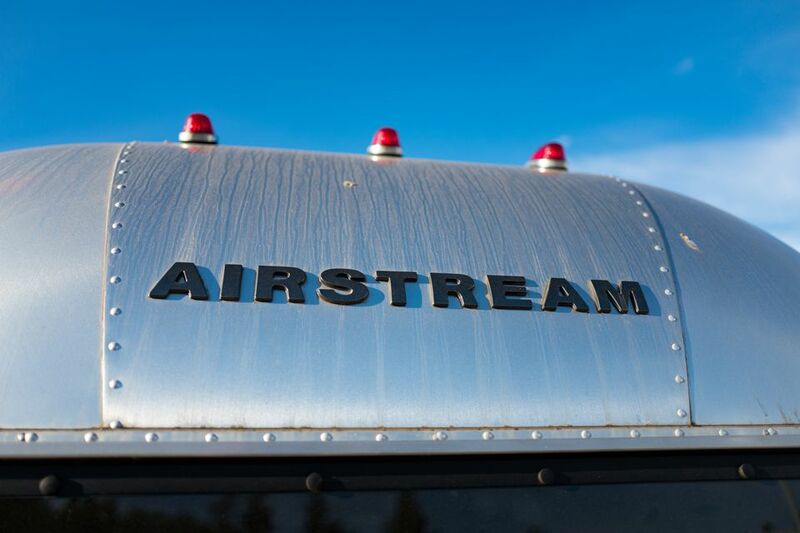 Step into the Airstream's cabin, and you enter a long and relatively narrow space whose design is characterized by its curved walls finished in riveted, polished aluminum. Our units had pleasant and convincing faux hardwood (linoleum) flooring, which leads from a dinette and fold-out sofa area past the kitchen and bathroom. On the other curved end of the trailer, a bedroom features a queen bed flanked by a wardrobe with drawers and a small nightstand. The kitchen incorporates a five-cubic-foot fridge, microwave, stove and sink, while the bathroom combines a nautical-style septic toilet with a small hand sink — think of it more as a boat-style powder room than the facility you've got at home. The Airstream's interior is peaceful and efficient — not unlike a ship's cabin, thanks to its light color scheme, clever storage compartments, and banked windows and skylights which let in copious amounts of natural light. In fact, sunlight can heat up the Airstream rather quickly and transform it into a stifling greenhouse on a warm day, but roof vents and air conditioning bring down the temperature rather easily, thanks to the space's limited cubic square footage. Though the interior is snug, room dividers fold out from doorways like accordions and offer some privacy. I didn't intend on spending too much time inside the Airstream — especially with historic Key West only 14 miles away — but I did slip into a bit of work catch-up. Productivity was facilitated by KOA's Wi-Fi service, which is available for a nominal daily fee. Sprawled out on the sofa, the Airstream's interior served as a cozy office-away-from-home, with the built-in automotive stereo system with iPod input offering a relaxing way to make the space my own. Though I never switched it on, I could've also put my feet up and watched the flat screen TV. The bathroom space is tight—as is the shower, which required me to bend my five foot, eleven inch frame a bit sideways in order to get maximum water coverage… but hey, it got me clean! Bonfires are available at the tent camping area adjacent to the Airstreams, which we took advantage of on our last night—though our purchase of DuraFlame logs unfortunately prevented us from roasting marshmallows. KOA's venture with Airstream offers a definitively unique alternative to the hotel experience, thanks to the trailer's streamlined layout, pleasant construction, and modest creature comforts. And, it's reasonable at $157/night off season and $180/night during peak season, December through March. Looking for room and turndown service? You might want to seek more conventional accommodations. But if you're up for an adventure and don't mind immersing in campground culture, the KOA/Airstream experience is a novel way to experience the Florida Keys. UPDATE: The Sugarloaf Key/Key West KOA is currently closed for renovations. The campgrounds was damaged badly during 2017's Hurricane Irma and is still in the process of rebuilding. Check the KOA's site for updates before heading there.